This review was commissioned by the British Museum. An edited version was used on their blog; this is the full version. When someone talks about relics, the first thing we all think about is religion. In the modern world, where atheism and agnosticism is rife, you might ask how a collection of hair and bones could be interesting. The answer to that is complex. 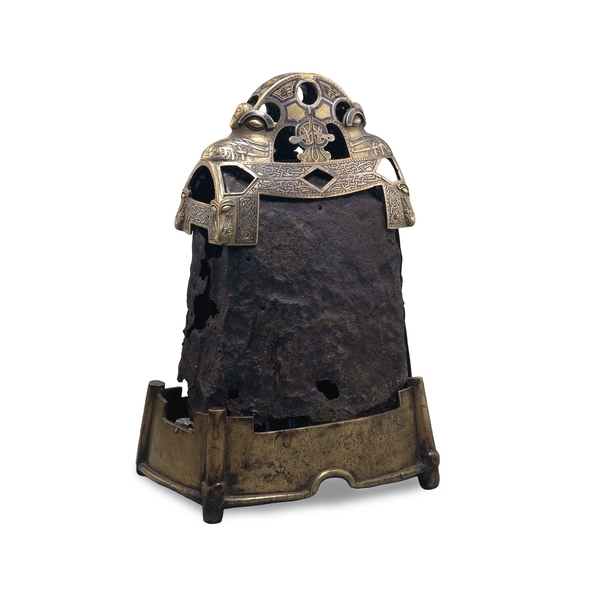 First, it’s important to realise that it isn’t really the relics themselves which are on display, but the reliquaries – the constructed objects in which the relics are housed. Second, the Treasures of Heaven exhibition is unusual for a museum, in that these are very much “live” artefacts – despite the age of the items, they are not the abandoned statues of an extinct society, or the purely decorative and intellectual pleasures of the art gallery. Instead, they are an integral part of Christian culture, still venerated by the faithful, and, for some of the reliquaries, this is the first time that they have been seen outside the religious institutions to whom they belong. Perhaps most significantly, the majority of the objects on display are made from precious metals. In the modern age, the computer is the pinnacle of technological development, and during the Industrial Revolution it was vast machines that filled the role. But prior to that, during the middle ages, it was the products of the metalworker that represented the very best of human ingenuity. Popular culture gives the impression that arms and armour were the heart and soul of metallurgy, but work in the precious metals is no less inspiring, and in fact, the two branches go hand in hand, one feeding into the other. As a jeweller, and a medievalist, the exhibition was a very exciting opportunity to see the labours of my predecessors first hand. It’s one thing to read about the methods they used, and another to behold these objects, and see the tool marks – remembering that each stroke of the engraving, and each strike of the hammer, had a human hand behind it, using tools that are not so different to the ones I use today. But these aren’t the works of a single artisan; rather, they represent a high level of social and economic organisation – the materials, like enamel and gemstones, would be purchased by, or given to, a particular religious order, and the work might be done within a monastic workshop, or perhaps by secular artisans in a nearby town. Within that workshop would be masters and apprentices of various persuasions – experts in casting, forging and gilding, others who worked with the precious stones, others who would engrave and polish the metal. One such workshop is described in a 12th Century book, called “On Divers Arts” by an artisan-monk calling himself Theophilus, where even the steel tools were produced in-house. Another writer, this one from the Renaissance, was Cellini, whose “Treatise on Goldsmithing and Sculpture” is a mixture of technical detail and arrogant self-aggrandisement, and describes work done for cardinals, popes and kings. Sadly, such texts are uncommon, and we know little of nameless artisans who, through secrecy or illiteracy, never recorded their methods for posterity. All we have left of them are the artefacts, of which the reliquaries are exceptional examples. As the reliquaries are so large, you might expect them to contain a huge amount of gold and silver, but one of the key arts of producing these reliquaries was giving the appearance of extravagance, while being frugal with materials. 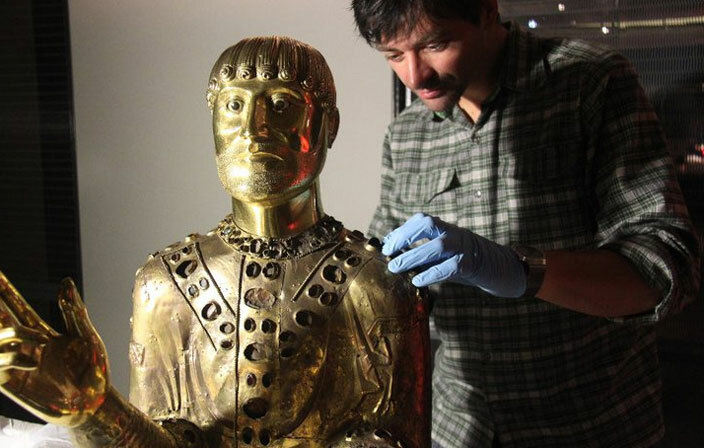 This is easier to understand when you look at an object like the Bust of St. Baudime (pictured), which would weigh hundreds of kilos if it was made of solid gold. Instead, you’ll often find that there is a wooden core, over which metal foil is shaped, and then pinned into place. Even then, the foil is often not gold, but silver or copper which has been fire-gilded with a mixture of gold and mercury. So, many of the objects actually have a relatively small gold content, although you’d never know without detailed examination. That’s not to say that the reliquaries are insubstantial. They have stood the test of time, and that speaks volumes about their construction. Some of the western European objects are made from sheet metal, and beautifully engraved and enamelled. Admittedly, these tend to be bronze, rather than precious metal, but the work is no less impressive. My personal favourite is the Bell Shrine of St. Cuileáin (pictured top), which has an almost sci-fi quality to it. Aside from the excellent knotwork decoration, the piece is assembled from a mixture of cast and forged sections, and has a feeling of solidity that you can see across the room. I wonder if the Bell Shrine has lost some of it’s original decoration, because the lower section is plain metal, and this is quite unusual. Generally, the reliquaries have every possible surface covered with elaborate designs in a wide range of materials and techniques, whether that is three dimensional patterns in wire filigree, or engraved pictures inlaid with a black material called niello; an alloy of silver, lead and sulphur that has been used throughout history for it’s strong contrast with the surrounding metal. All of this decoration is impressive in it’s own right, but it is also very functional – before the modern era, highly polished metal was very difficult to produce. If you take a close look at the Bust of St. Baudime (one of the few pieces to have large areas of plain metal), you will see long marks across the surface, caused by a scraping tool, which the later stages of polishing could not remove. Nowadays, if you’re buying an item of jewellery, you generally expect a mirror finish, but that really wasn’t possible in the past, and by adding texture and depth, it becomes easier to produce a glittering facade. It isn’t often that we get a chance to see such a wide range of methods in one place – the exhibition is almost like a catalogue of techniques. Nor do we normally get to see objects that cover over a millenia of history, across so many different cultures, each with it’s own unique take on Christianity. From the post-classical styles of the Byzantine Empire, to the pagan-influenced works from the British Isles, and everything in between, the Treasures of Heaven exhibition is a stunning testament to the passion, inspiration and ingenuity of our ancestors, and their search for beauty in a world of tragedy and violence.